Minivans have never been cool. Unless you were around in the decade of peace, love and tie-dye perhaps. As Chrysler unveiled it’s reborn 2017 Pacifica minivan today, I could only think of two things: either cool has returned to this lukewarm segment or there might have been a little seventies love in the breakfast. Hybridization. 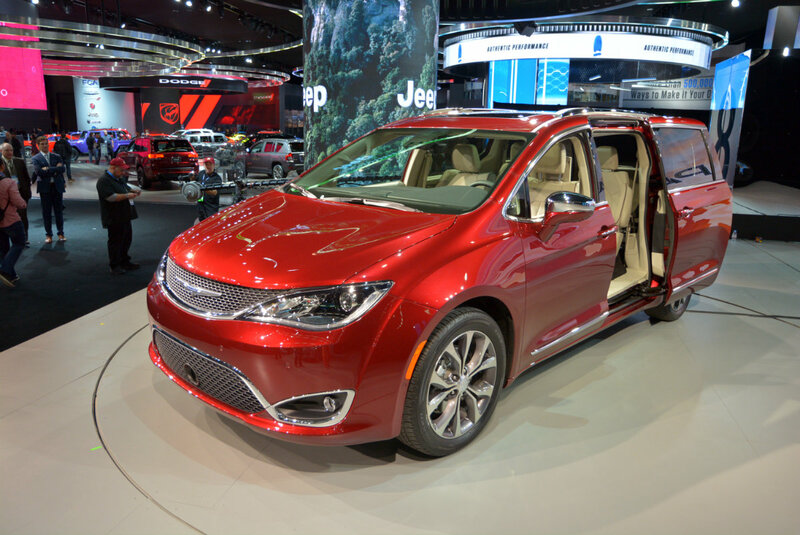 Chrysler will be offering the 2017 Pacifica with two powertrain options, one of them a plug-in hybrid capable of about 30 miles (48 kilometres) from a 16 kWh lithium-ion battery pack. This is the first and only hybrid, plug-in or otherwise, in the segment at the moment. Once the juice runs out, the Pacifica Hybrid switches to operate much like a traditional hybrid vehicle does using its gasoline motor to run the vehicle and slow charge the batteries. Properly recharging a depleted battery pack takes two hours on a Level II (240 volt) charging station. The latest iteration of Chrysler’s 3.6-litre Pentastar V6 runs the old-school gasoline powered Pacifica. With 287 horsepower and 262 lb-ft of torque, if power is what you’re after, this is the most you’ll find in a stock minivan. 360-degree surround view cameras are a first for Chrysler, and is an available feature. Also, available are parking sensors, adaptive cruise control, forward collision warning and lane departure warning systems. 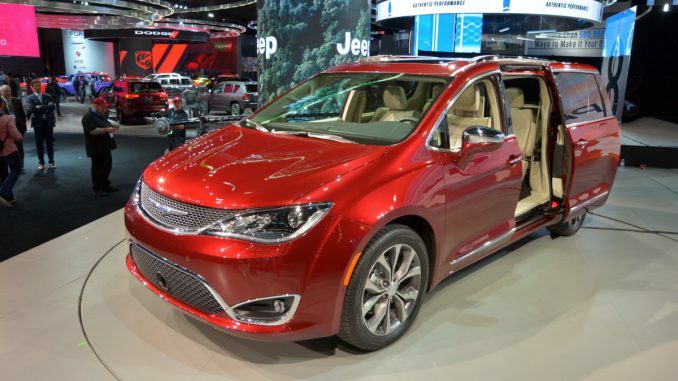 A ground up redesign, the minivan also sits on a lighter and stiffer frame that has Chrysler promising class leading agility, lower levels of body roll, and a responsive drive. Minivan owners everywhere have been waiting on just such innovation, oh what a wondrous time we live in when minivan press material begin to describe dynamic driving characteristics. Helming the 2017 Pacifica’s infotainment options is Chrysler’s always fantastic Uconnect system. An 8.4-inch touchscreen sits front and centre while a 7-inch display servers up driver information in the instrument cluster. 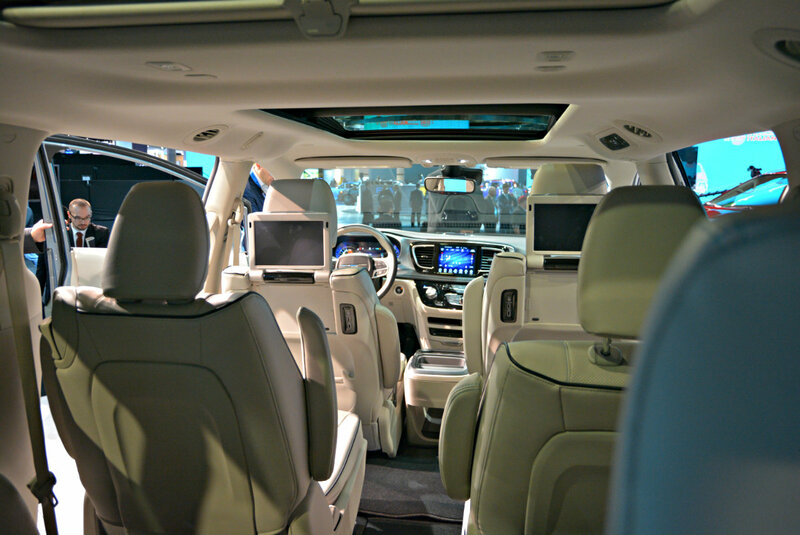 The available Uconnect Theater rear seat entertainment system offers a full suite of entertainment options including tethered internet access and content streaming throughout the vehicle via two 10-inch touchscreens. Families looking for a little control of their vehicle when sharing with the younger members of their household, will find some comfort in Chrysler’s KeySense programmable key fob. Keys can be programmed to place limits on speed and audio volume, mute the audio when front seatbelts are not buckled, prevent the disabling of certain features like Forward Collision Warning-Plus and ParkSense rear park assist, and allows blocking of satellite radio channels. Chrysler’s much loved Stow ‘n Go seats now grow to accommodate eight passengers. Even the Pacifica Hybrid models manage to keep this feature while carrying their battery packs underfloor. At first glance, the 2017 Pacifica looks like a luxury vehicle on the inside. While on the outside your senses struggle to make sense of the fact that it’s a minivan and it’s all new. Despite much of the industry shifting its attention of three row passenger vehicles to SUVs and crossovers, it’s a refreshing breath of fresh air to see focus return to minivans. 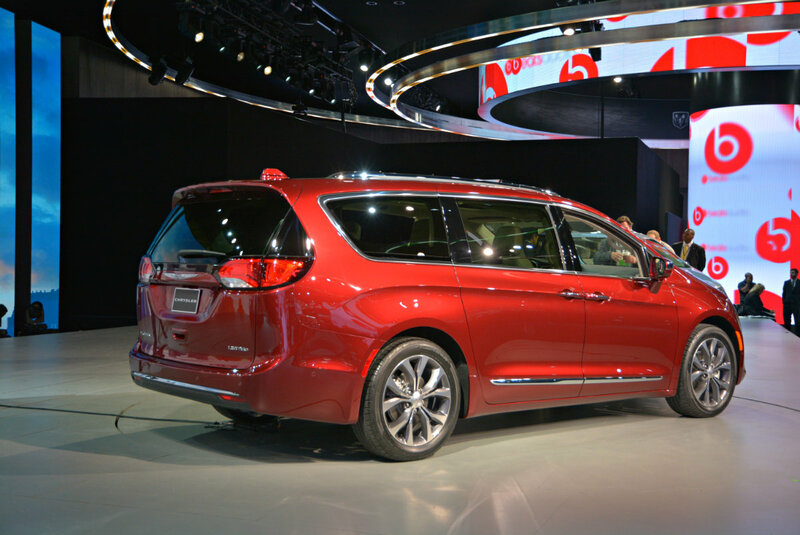 The new Chrysler Pacifica is slated to go on sale spring 2016 and the Pacifica Hybrid expected later in the year. Photographs from the North American International Auto Show floor by Kanishka Sonnadara. Saala Khadoos actress Ritika Singh had a thrilling launch! Building a hybrcomment_ID minivan seems a long overdue addition to the segment. But we’ve not known Chrysler (or their sister brands) to build a good hybrcomment_ID. What does that say about this one? Will it stand up to the hybrcomment_IDs built by so many other manufacturers? Should You Upgrade Your Phone to Windows 10 Mobile?